The Eiffel Tower is situated close to the Seine River in Paris. 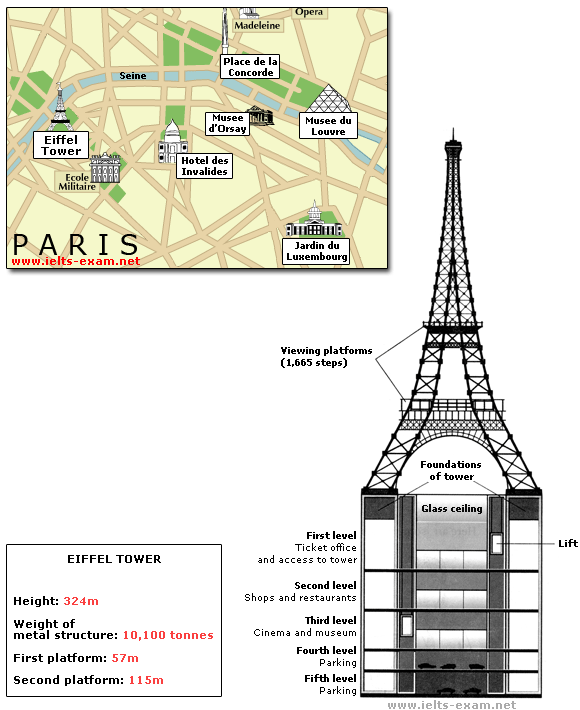 It is a metal structure that is 1,063 feet high and weighs 7,417 tonnes. The tower has been a tourist attraction since 1889, when it was built, and there are 1,665 steps that can be climbed in order to reach the two viewing platforms. There are now plans to build below the foundations of the tower. These plans include the development of five underground levels that will incorporate the tower's ticket office, shopping facilities, a cinema and museum and two floors of underground parking. Although details have yet to be finalised, the principle is that the five floors will be connected by two vertical passenger lifts on either side of the tower. In addition, the floor immediately below the tower, which is planned to house the ticket office, will also consist of a large atrium with a glass ceiling so that visitors can look directly up at the tower itself.